The only ways to travel direct from Kanchanaburi to Hua Hin are to travel by minivan, taxi or to drive yourself in a car or on a motorbike. Travel by minivan is the cheapest way to travel direct from Kanchanaburi to Hua Hin. You can also travel by train from Kanchanaburi to Hua Hin by changing trains at Sala Ya. 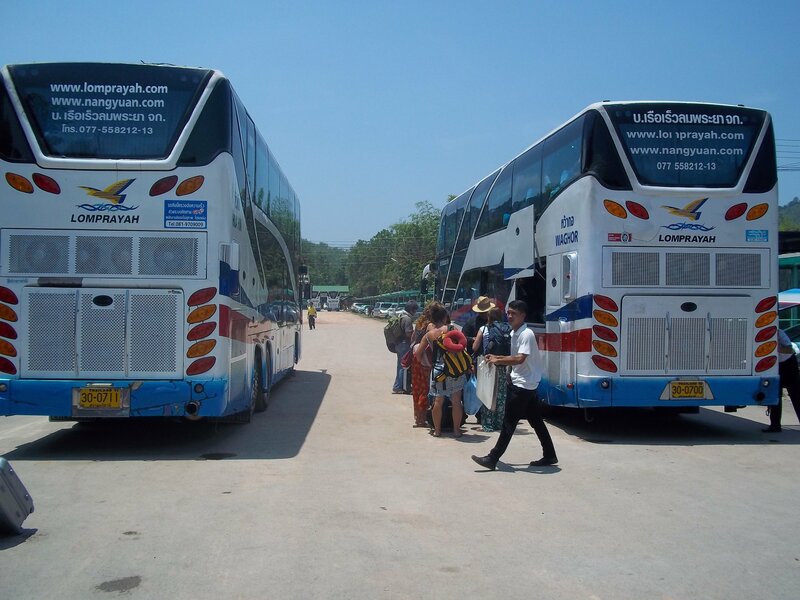 These services from Kanchanaburi to Hua Hin are operated by J.K.P Transport Co., Ltd.
Minivan services to Hua Hin depart from Kanchanaburi Bus Station. Minivan services to Hua Hin terminate at the Hua Hin 51 Alley Bus Station. The most direct route to travel by train from Kanchanaburi to Hua Hin is via Sala Ya. There are two trains per day from Kanchanaburi to Sala Ya. There are then 15 trains a day from Sala Ya to Hua Hin. The departures listed below from Sala Ya are the two trains to Hua Hin whose departure times from Sala Ya best coincide with the arrival of the trains from Kanchanaburi. Train tickets from Kanchanaburi to Sala Ya cost a fixed price of 100 THB for foreign passengers and are free for Thai citizens. Train tickets from Sala Ya to Hua Hin cost from 89 THB to 994 THB depending on which type of train seat you book and which train you travel on. If you pick the cheaper seat types then train is the cheapest way to travel from Kanchanaburi to Hua Hin, although the quickest time it is possible journey time by train from Kanchanaburi to Hua Hin is 6 hours 14 minutes, which is over 2 hours slower than travelling by minivan or taxi. Use the Search Box below to book tickets to travel by minivan from Kanchanaburi to Hua Hin. For train tickets from Kanchanaburi to Sala Ya and Sala Ya to Hua Hin we recommend that you buy these at the station on the day of travel. Tickets on the train from Kanchanaburi to Sala Ya can only be purchased on the day of travel, and it is advisable to wait until you arrive at Sala Ya before buying the onward ticket to Hua Hin. Sometimes trains from Kanchanaburi to Sala Ya are delayed and the best strategy on arrival at Sala Ya is simply to buy a ticket on the next departure to Hua Hin when you arrive. There are 15 trains a day from Sala Ya to Hua Hin which means you have plenty options. Minivans from Kanchanaburi to Hua Hin depart from Kanchanaburi Bus Station. Kanchanaburi’s main bus station is located off the Sangchuto Road, which is the main road running through urban Kanchanaburi. The bus station is located some distance (4.9 km) from Bridge over the River Kwai and a 1.8 km walk from Kanchanaburi Train Station. Minivan services from Kanchanaburi to Hua arrrive in the bus station on Alley 51 (Soi 51) which is a side street off the Phet Kasem Road. 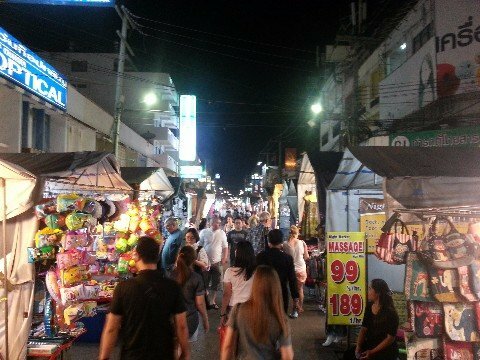 The Alley 51 Bus Station is 1.2 km walk away from Hua Hin’s famous Night Market and a 1.7 km walk away from Hua Hin Train Station. 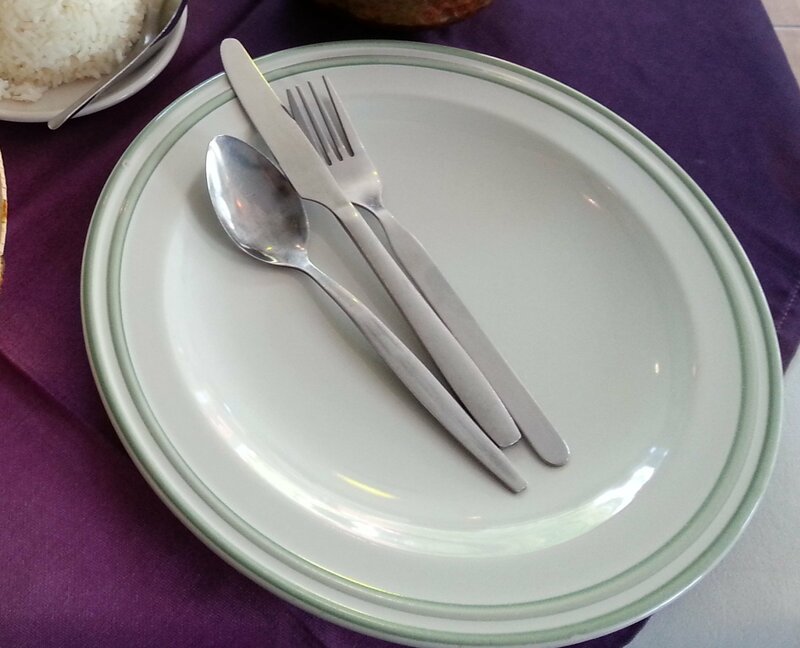 For somewhere cheap and good to stay try the Chaba Chalet which is 1.4 km from the Alley 51 Bus Station. Trains to Sala Ya (where you need to change trains to travel onto Hua Hin) depart from Kanchanaburi’s main train station. Kanchanaburi Railway Station is just about within walking distance of many of the popular small riverside resorts on the Maenamkwai Road. For example, it’s a 1.5 km (19 minute) walk from the Good Times Resort to Kanchanaburi Railway Station. However, before you decide to walk to the train station from your resort check the distance and consider how much luggage you have. It get very hot in Kanchanaburi (it’s one of the hottest places in Thailand) and it can be very tiring walking even a relatively distance if you have a large bag, or small children, to carry. 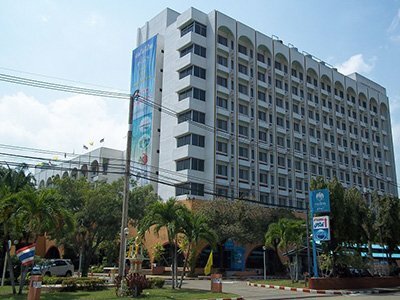 Hua Hin Train Station is close to Hua Hin Night Market (550 metres) and the Hilton Hua Hin Spa & Resort (800 metres) is on the city centre beach. If you are staying at one of small hotels near the Night Market on the popular Sa Song Road then you can walk probably just walk there. If you do need a taxi then there are always plenty waiting outside the train station, although be sure to agree a price before you set off as they are very unlikely to agree to turn on their meter.